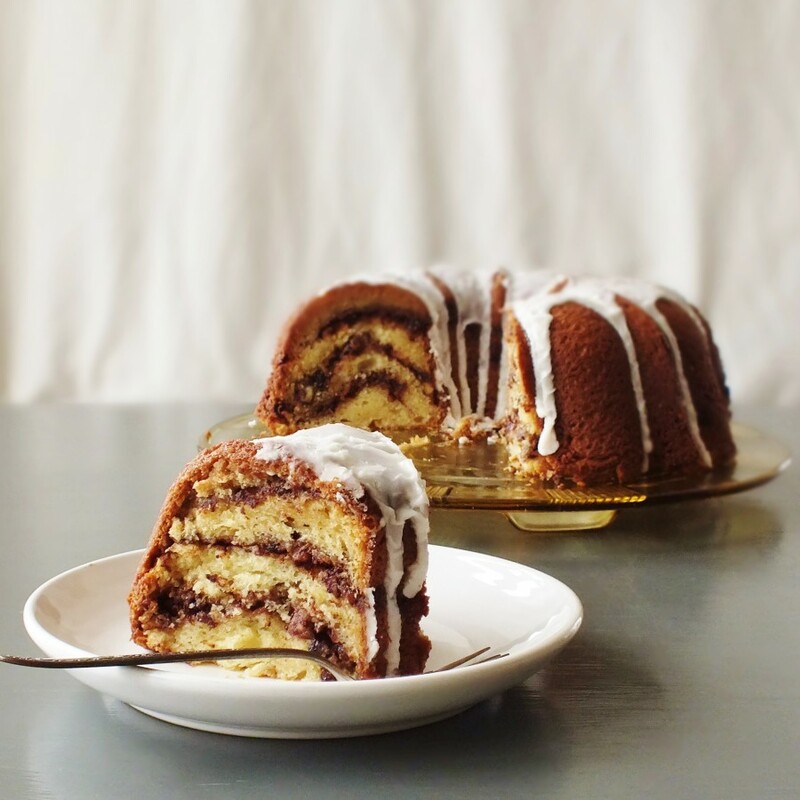 This is a recipe from Maida Heatter, a pastry chef and cookbook author of numerous books on desserts and baking. 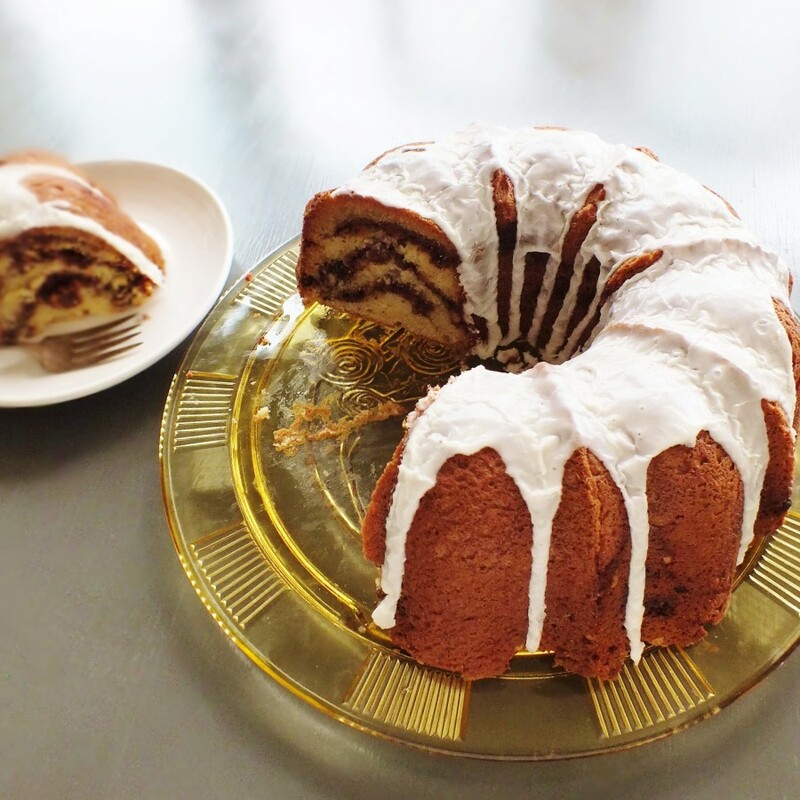 It is called the Budapest Coffee Cake, and is from “Book of Great Desserts”. It was (is?) the most popular recipe from that book, published in 1974. I like it because it contains cinnamon AND cocoa powder. And that there are two cups of sour cream, making it an incredibly moist cake that keeps well. 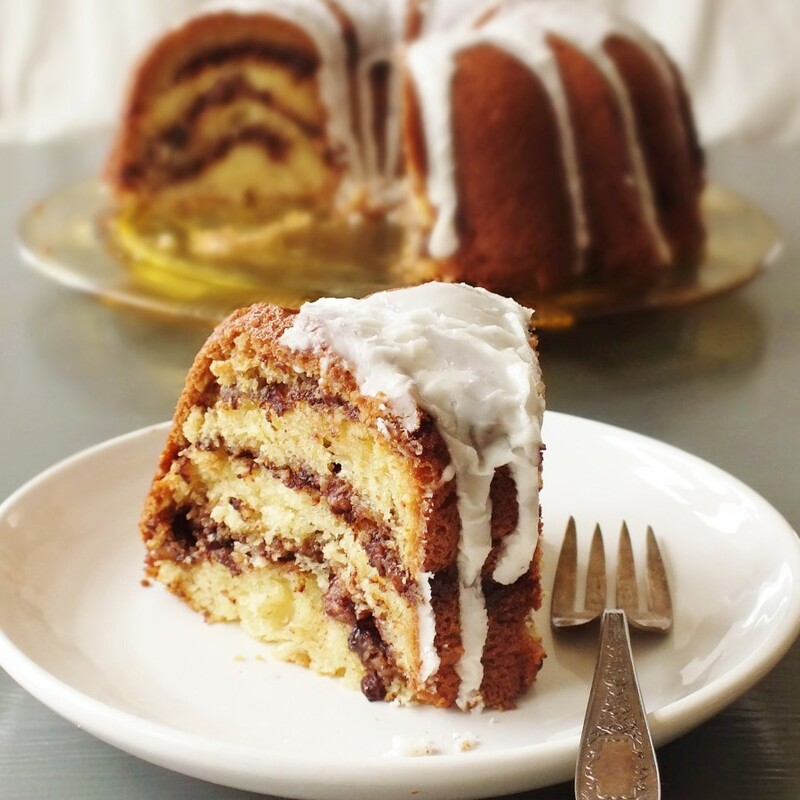 And also that the streusel-type stuff in coffee cakes that is often put on top of many coffee cakes is instead baked in layers in this bundt cake. Amazing. Maida Heatter is Genius. I even bought one of her books already, and so you can count on another post of a Maida Heatter recipe real soon! Butter a 10-inch Bundt pan. Set aside. Combine the brown sugar, cinnamon, and cocoa in a small bowl. Mix thoroughly. Stir in nuts and currants. Set aside. Sift flour, baking soda, baking powder, and salt, into a large bowl. Cream the butter in bowl of an electric stand mixer, using a paddle attachment. Add the vanilla and sugar and beat on medium speed for a minute or two. Add eggs, one at a time, beating each until just incorporated. Scrape down sides of bowl, as necessary, to keep mixture smooth. Beat at high speed until mixture is light and creamy, about 1 minute. Turn mixer to low speed. Add dry ingredients in three additions and sour cream in two additions, beating only until smooth after each addition. Spread a thin layer of batter in bottom of prepared pan. Sometimes it’s easier to use a small spoon to drop some batter into pan, and then to smooth it together. Top with 1/3 of nut mixture. Repeat until you have 4 layers of batter into pan and smooth it together. Top layer will be batter. 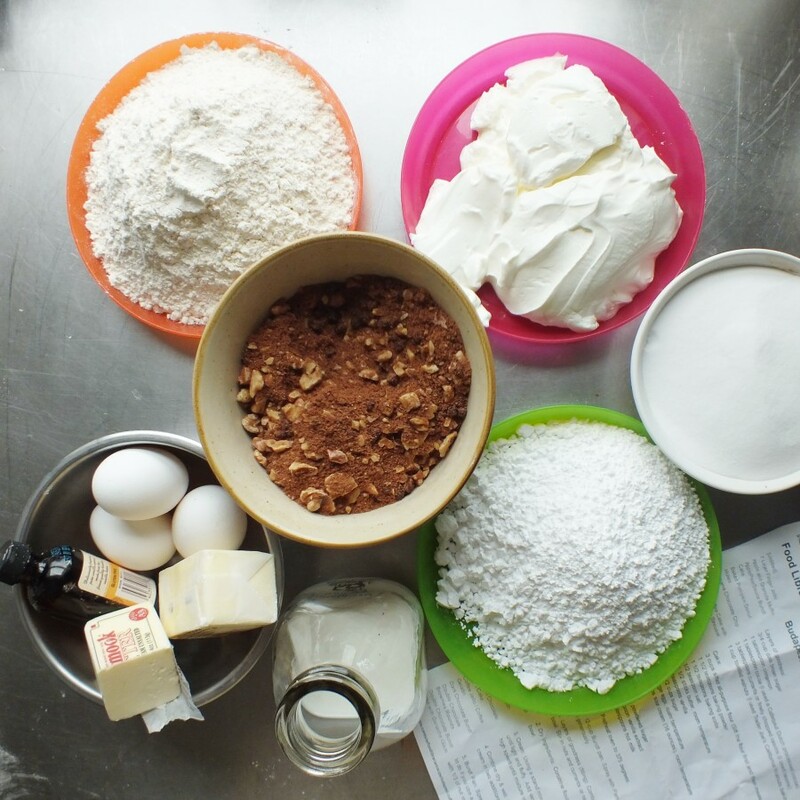 Bake 50-60 minutes, or until cake tester inserted in center of cake comes clean. Remove from oven and cool for 5 minutes, then turn out and reinvert on a rack. Combine powdered sugar, hot milk, and vanilla in a small bowl. Mix well, Mixture should have the consistency of a thick cream sauce. Spread wax paper underneath a cooling rack. 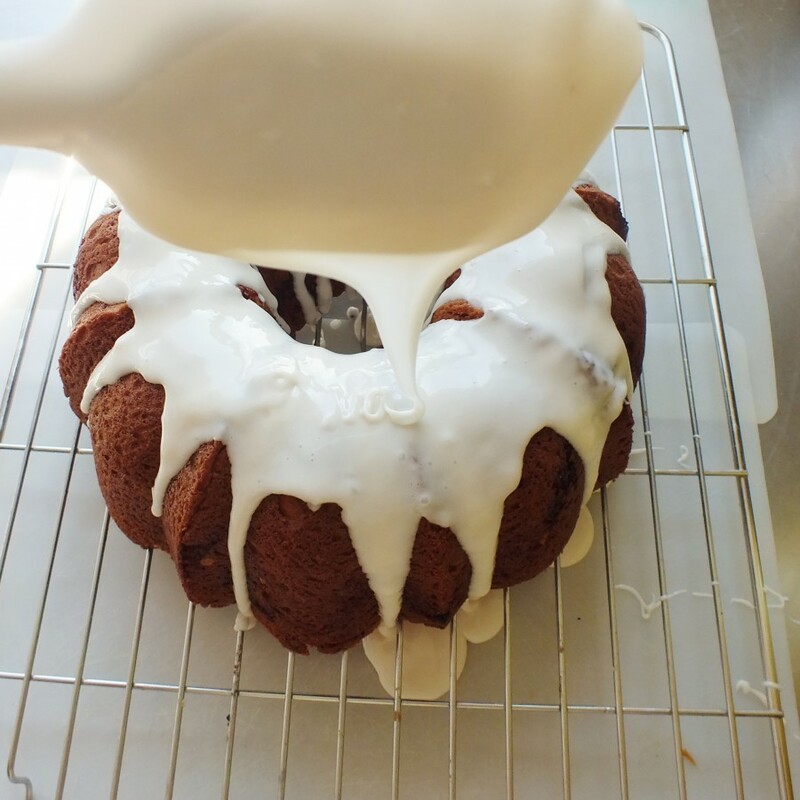 Pour glaze over cake, letting it run down the sides, while still hot. 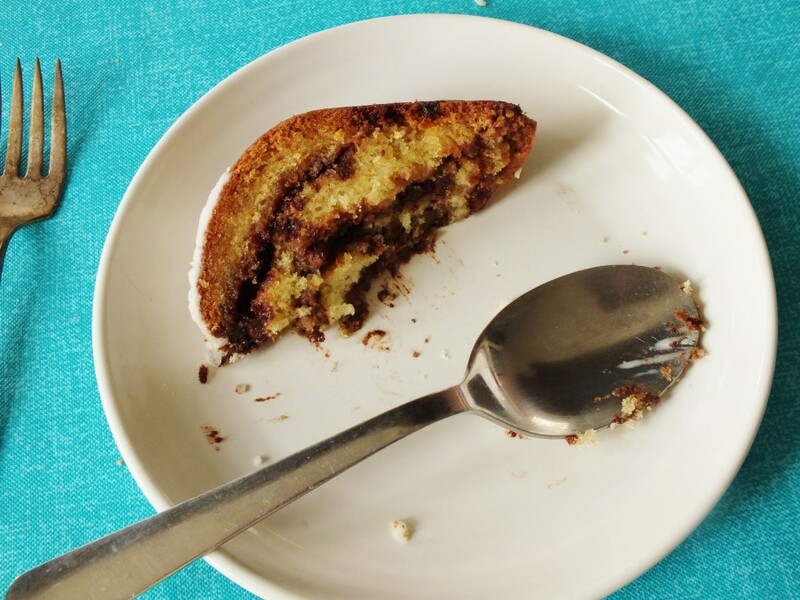 When glaze is set, transfer cake to a serving plate. When glaze is set, transfer cake to a serving plate. Cake may be served warm or at room temperature. Yeild: 12 servings. 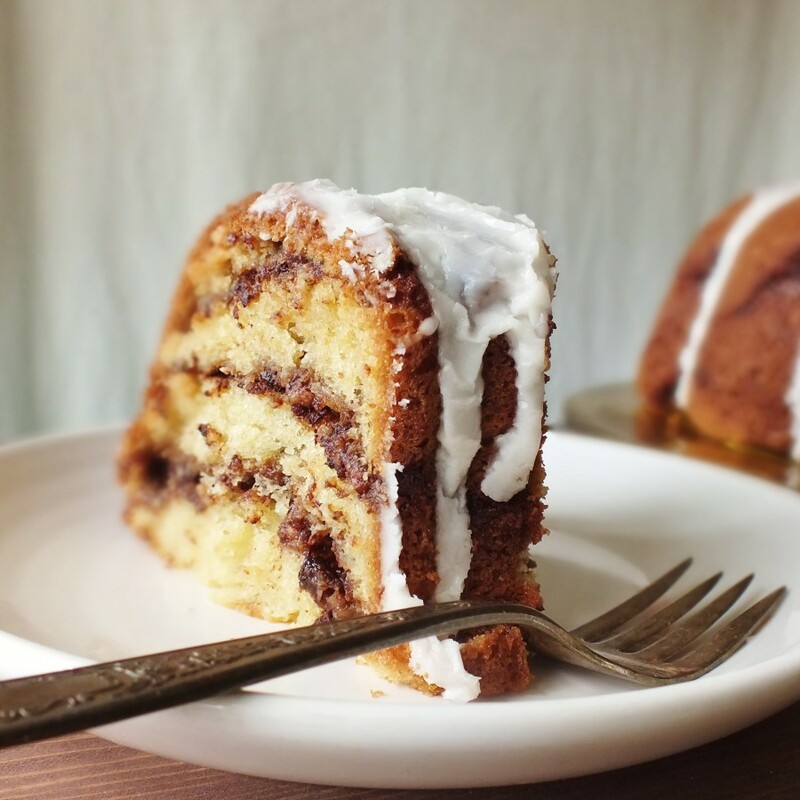 This entry was posted in baked goods, baking, breakfast, brunch, cakes, cocoa, coffee cake, dessert, Maida Heatter, quick bread and tagged Budapest Coffee Cake, cinnamon, cocoa powder, coffee cake, currants, walnuts. Bookmark the permalink. 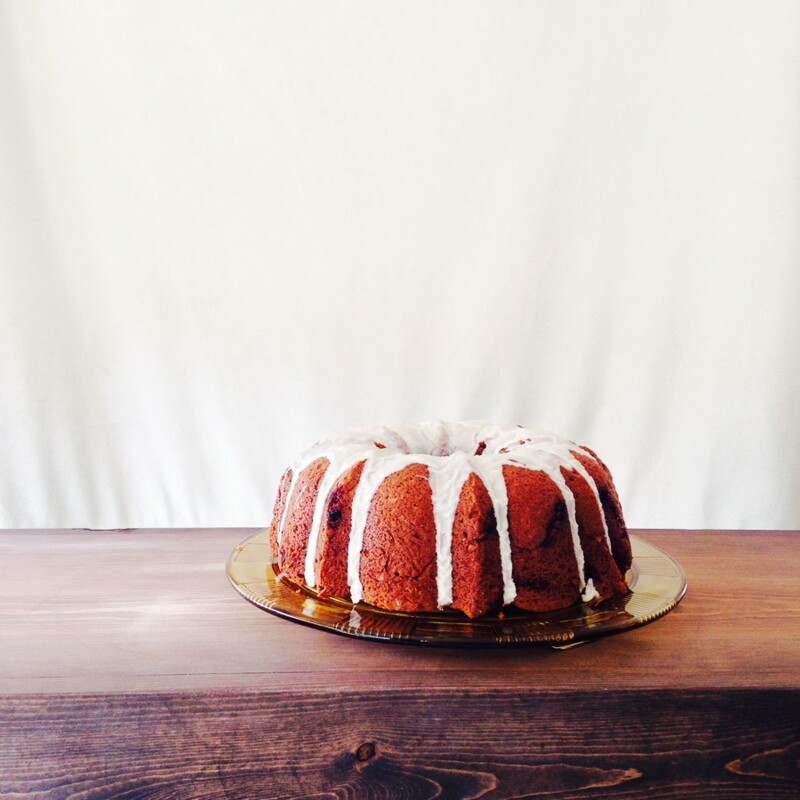 what a stunning cake – I love baking bundts. 🙂 me too. Thanks for stopping by and have a good rest of the weekend! Thanks and yes it was! Enjoy your day! This looks delicious, I have to try! Oh wow Dave, this looks fantastic! Sounds like a great cookbook. 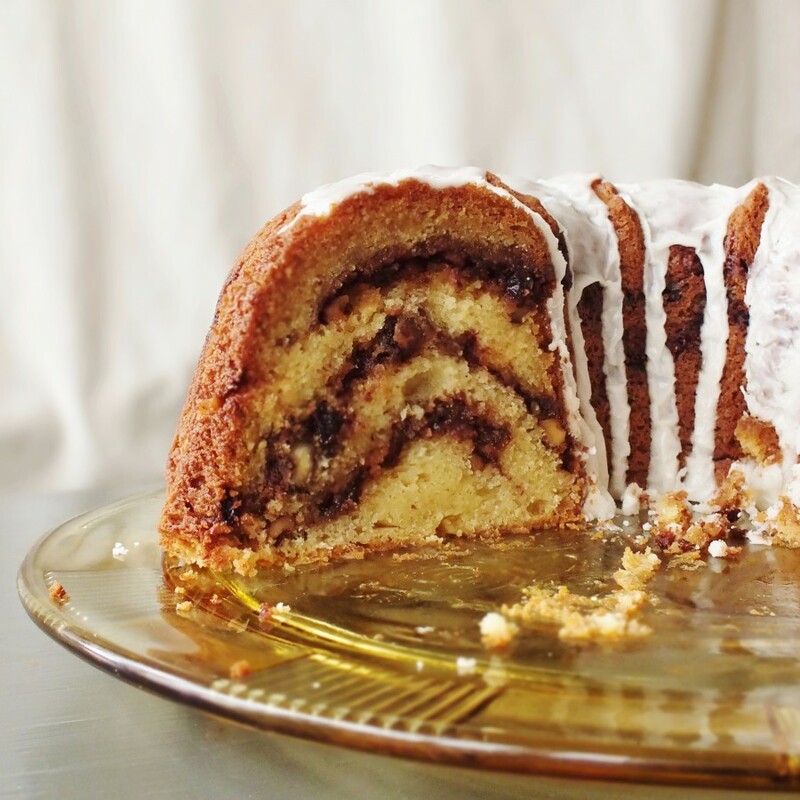 Love the layering of the streusel and the drizzled glaze. Good looking cake! Thanks! It was tricky to slice, because it’s so soft and moist. I would’ve preferred to cool it in the freezer, but it really needs to be served warm or at room temperature. I’m discovering there is a whole world of cookbooks and authors that are pre-internet, where you can’t really just look it up online and expect a picture of the dessert. She has some recipes that other people have made, but not like Martha Stewart, or Nigella Lawson, or any others. The next recipe I’ll post about is from a restaurant in NYC that no longer exists. Sounds great, looking forward to it. Love pre-internet cookbooks. Vintage…right? I love vintage stuff too. This recipe might not be vintage, but it definitely is from a few decades before this one. Nom nom. This looks so DELICIOUS. I am hungry now! Gorgeous cake! Oh how I wish a certain someone in my house wasn’t allergic to nuts! You know, you could probably leave them out, although it’s quite a large amount. I imagine that the loss of 1 cup of nuts would change the mouth feel somewhat. Or, just make something else. Or Maybe you can substitute something crunchy, like cocoa nibs?